I cut this down from another recipe, Auntie Mella’s Italian Cookies, because I only had two eggs. I also made it non-dairy and switched to anise oil. 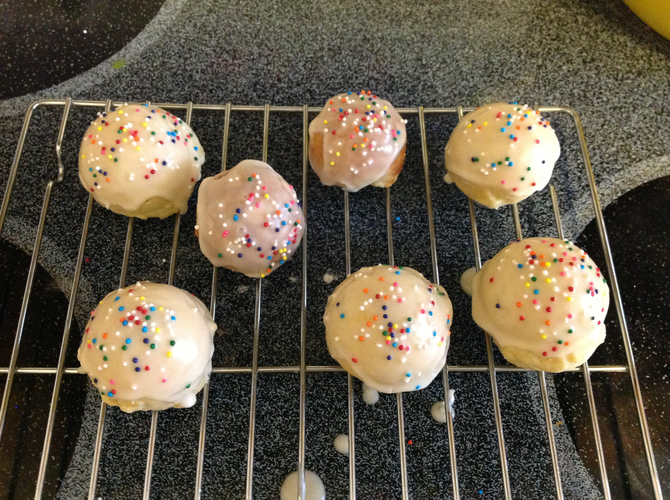 Note that you can use a cake ball pan for these--the only use I've found yet for my cake-ball pan. Mix eggs, sugar, and anise. Add oil and milk. Add flour and baking powder. Roll out walnut-sized and place on parchment-paper lined cookie sheets (or drop into cake ball pan). Bake 10-12 minutes at 350 degrees. Mix icing. Dip and sprinkle.